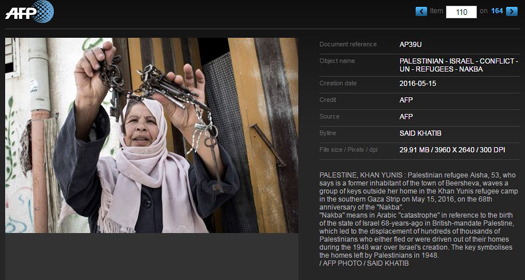 An Agence France Presse photo caption correction today underscores the media tendency to conflate the approximately 600,000 Palestinians who fled or were expelled from Mandate Palestine with their millions of descendants. The United Nations’ unique definition for Palestinian refugees, probably the only displaced people in the entire world whose descendants also receive refugee status, likely contributes to the problem. Palestinian refugee Aisha, 53, who says is a former [sic] inhabitant of the town of Beersheva, waves a group of keys outside her home in the Khan Yunis refugee camp in the southern Gaza Strip on May 15, 2016, on the 68th anniversary of the “Nakba”. “Nakba” means in Arabic “catastrophe” in reference to the birth of the state of Israel 68-years-ago in British-mandate Palestine, which led to the displacement of hundreds of thousands of Palestinians who either fled or were driven out of their homes during the 1948 war over Israel’s creation. They key symbolises the homes left by Palestinians in 1948. As CAMERA noted earlier, Aisha, who is reportedly 53 years old, could not have fled or been driven out of her Beersheva home 68 years ago, as the caption strongly suggests. 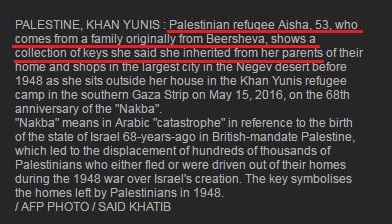 She possibly could have lived in Beersheva and decided to move to Gaza for marriage, for example, but then she is not a “refugee” forced out of her home in the 1948 war, as the caption clearly implies. CAMERA contacted AFP editors, asking if Aisha was an inhabitant of Beersheva. If so, why did AFP conflate her decision to move with the fate of Palestinian Arabs who left in 1948 and became refugees? Unfortunately, AFP editors did not alert subscribers to the fact that the caption was corrected. Though editors did change the original caption in the archive, it is not marked with a “clarification” or “correction” note, and they did not republish the image today with the correct caption.